Have you been enjoying the busyness like I have? I know a lot of people complain about all the things to do this time of year, but I really love it! I'm going to keep this post short and sweet and share some projects I worked on for gifts this year. First up is this Noodlehead Caravan Tote with a Hazel Hedgehog quilt block I made as a teacher gift. I used Joel Dewberry's Nottinghill and Essex Linen (from Fabric Spark), and kept the lining really simple for a quicker sew. Next is this super simple and quick free pattern from Thread Riding Hood for a Dopp kit. I used some vintage fat quarters I received as a Christmas gift last year. I used Color Me Fabric from Funky Monkey for the exterior of a small Sew Sweetness Creative Maker Supply Case - perfect size for some crayons, a coloring pad and some fun extras like stickers and stamps. This fun free pattern was also a quick sew and I used Jackie McFee's Heavy Metal fabric fromSitka Fabrics for just the right Christmas touch. Finally, I made some quick and simple placemats using Color Me fabric and Ann Kelle's adorable snowmen and trees from Funky Monkey Fabrics. I'd love to hear what you've been up to. Did you make Christmas gifts this year? I included the Bag of the Month Club in my big list of "What to get the girl who sews everything" and I thought I'd share a bit more info about it. Last year I received the Bag of the Month Club as a Christmas gift, and I wasn't quite sure what to expect. It turned out to be one of my favourite gifts ever! I looked forward to the first of the month to find out what the next bag pattern would be, and was never disappointed. Some of the designers were new to me, and it was so much fun getting to know some different styles of patterns. I also had fun joining the Facebook group specifically set up for the club, and it felt like a virtual sewing room, where we all were working on the same things. As if getting 6 new patterns wasn't enough, there were even prizes! Plus, I happened to win prizes from 2 different months last year - such an awesome feeling! This year there is a dedicated website just for the club, making it easier to sign up and obtain patterns as they become available. Sign up here. The club runs from January to June 2016, with a different designer putting out one bag pattern per month, for a total of 6 exclusive bag patterns. That's right! Exclusive! None of the patterns are available individually until after the club is over, so if you're a pattern collector (like me) then this is perfect for you! It's also great value. The club membership is $40 USD for all 6 patterns, and you can take advantage of the early bird discount and get the membership for only $35 USD if you join before January - that's less than $6 USD per pattern! Another new feature this year I'm especially excited about is that Emmaline Bags is offering complete Hardware Kits for each month. So far, January through April are available. So there you have it! 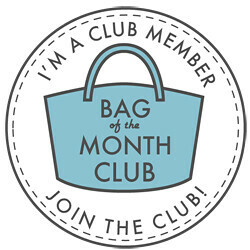 If you haven't already, head on over to the official website for the Bag of The Month Club and sign up. You won't be disappointed! Also, if you have a blog, grab yourself a button and add this to your site to show you're a proud member! p.s. I'm not affiliated with the club, I just think it's really great and want everyone to know about it! Before I get to the Birthday fun, I wanted to remind you to check out my recent post on Flare Fabrics and make sure you enter the giveaway (FREE fabric is always fun, right?!). Also, if you have missed mygift idea post, I'd love to hear what's on your wish list after you read mine. I'm so excited to be part of the 2nd Birthday Celebration Blog Tour for Radiant Home Studio! Sara asked me to sew up one of her patterns to show you all. I had so much fun choosing. I decided to go with the Water Bottle Tote. Before I share my project, I just want to point out some really cool features on the Radiant Home Studio site. First: the tutorials section on this blog is AMAZING!! Seriously, what a resource! 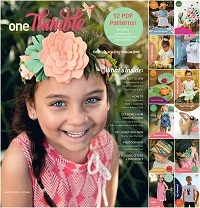 There's also a variety of sewing patterns available (and on sale now). You can also find Sara's fabric designs on Spoonflower and some work featured in the upcoming book On The Go Bags. I chose the Water Bottle Tote because it seemed like such a unique design. I envisioned using it as a wine tote, and then I remembered I don't have anywhere to go where I would bring 6 bottles of wine with me, haha! I still think it works really well as a market tote, and could be used for wine, honey, jam, etc. from a farmer's market. I'm just starting out as a soccer mom, so the water bottles will come, just not yet. I've been really wanting to do some selfish sewing and also needed to tidy up my sewing room, so I decided to make myself an organizer for my sewing room! Look at all the stuff I can fit in mine, and so organized! The pattern includes instructions for strong handles and exterior pockets, but I omitted both for this tote. I will say though, that I found the construction of the handles and pockets pretty clever, so I'll definitely add them on my next Water Bottle Tote. Sewing the lining and creating the divided sections was fun; I really loved seeing the tote take shape. I did find finishing the top of the bag a bit challenging and I hope you don't look too closely at my pictures and see my oopsies! Challenges aren't always a bad thing though, and it wouldn't prevent me from sewing up this highly functional pattern again. I liked that the pattern included instructions on how to deal with directional fabric; it was an easy fix, but it allowed me to do no math, which makes me happy! There's also a removable insert, so I used it as an opportunity to try out a new interfacing combination, and add a different fabric into the mix. I used Charley Harper Red Eye Vireo organic canvas from For the Love of Fabric for my exterior. I used Anna Graham's Rain Walk organic canvas for the lining, and organic cotton for the insert, both fromFabric Spark. For my interfacing, I used Pellon Craft Fuse where fusible interfacing is called for and Stiff Stuff from Funky Monkey for the insert (this is my new favourite interfacing!). See below for more stops along the blog tour and hop around and check out the other creations. Don't forget to take advantage of the sale in the Radiant Home Studio pattern shop: all patterns are 20% off until December 11! What would put in your tote?